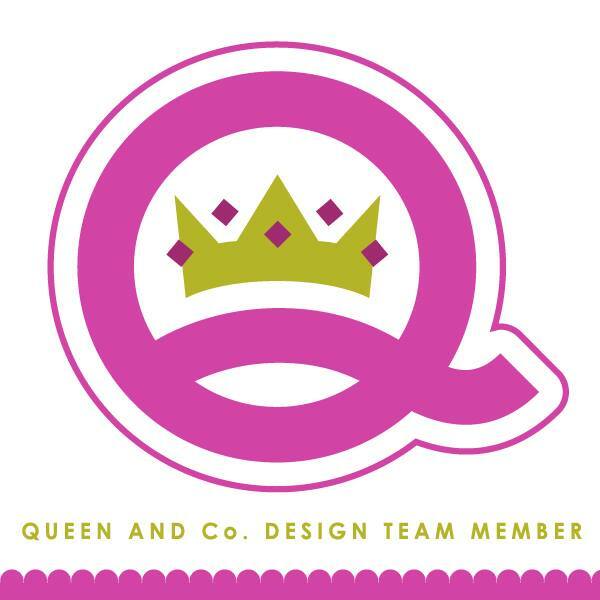 kim watson ★ design ★ papercraft: Scrapping birthdays + a new layout! 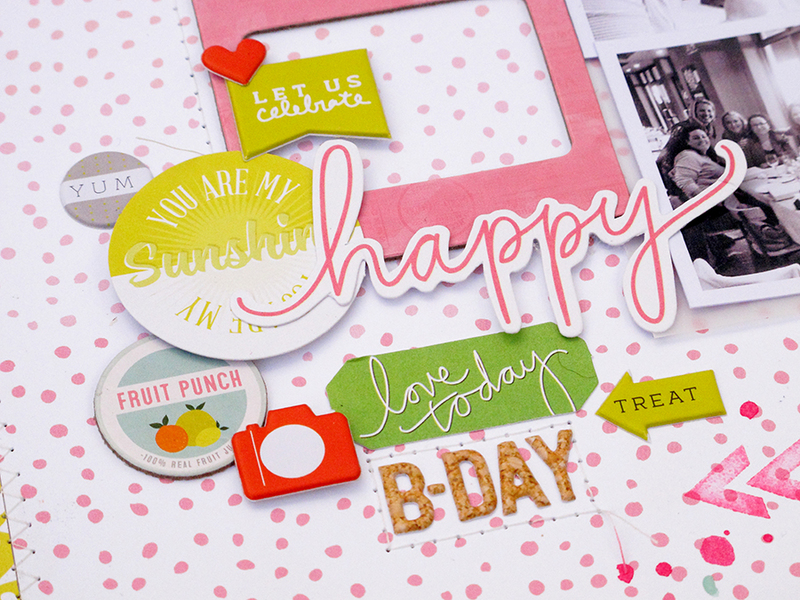 Scrapping birthdays + a new layout! Hi Kim here. 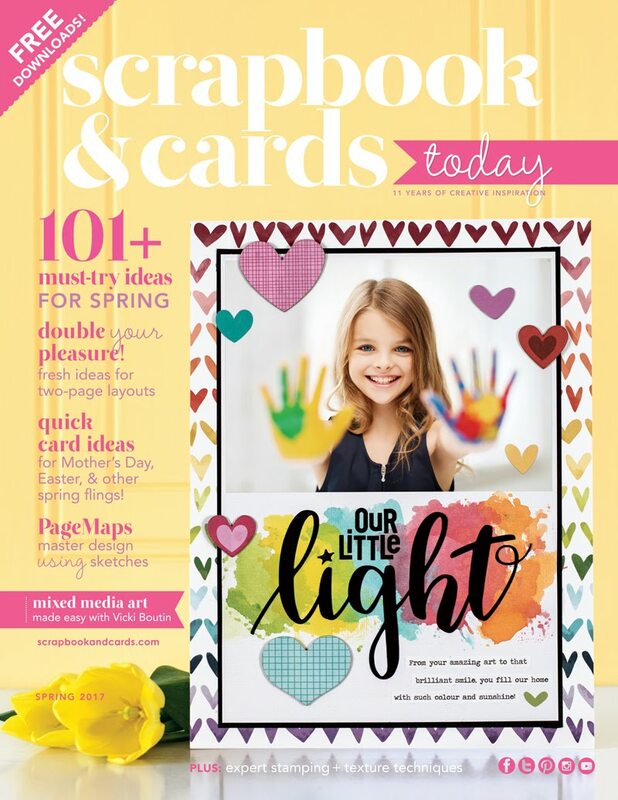 Today I am excited to share a page using the fabulous May Hip kits. The citrus colors are so fresh & funky. 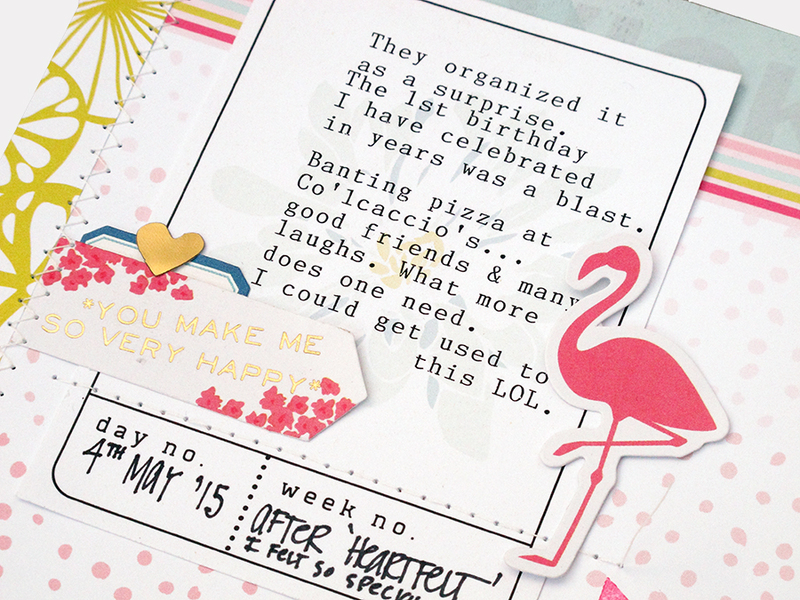 I really enjoyed the paper & embellishment combinations!! I love using patterned paper as a background for most of my layouts which means I end up mixing a few designs on one page. 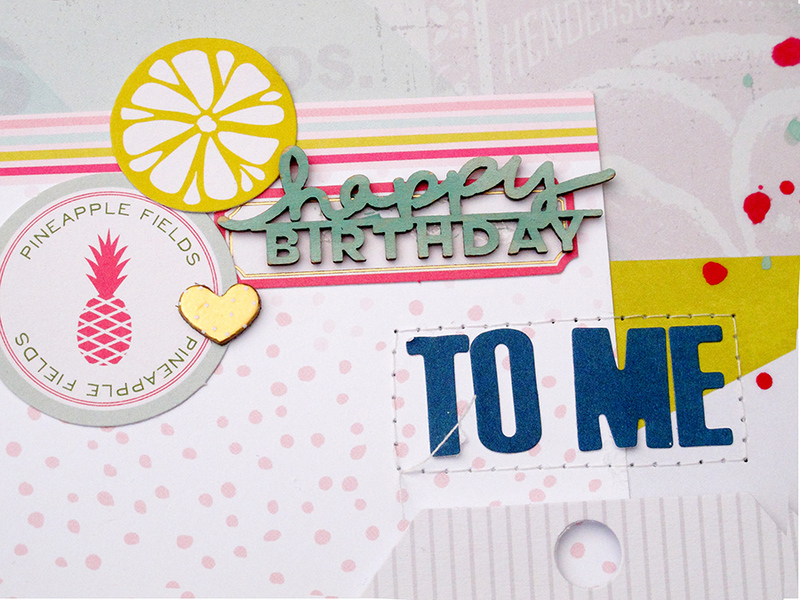 The coordinating patterned papers from the Hip Kits May Main Kit make doing that so easy. I was particularly drawn to the vibrant striped paper & ended up using it to determine my over color palette. 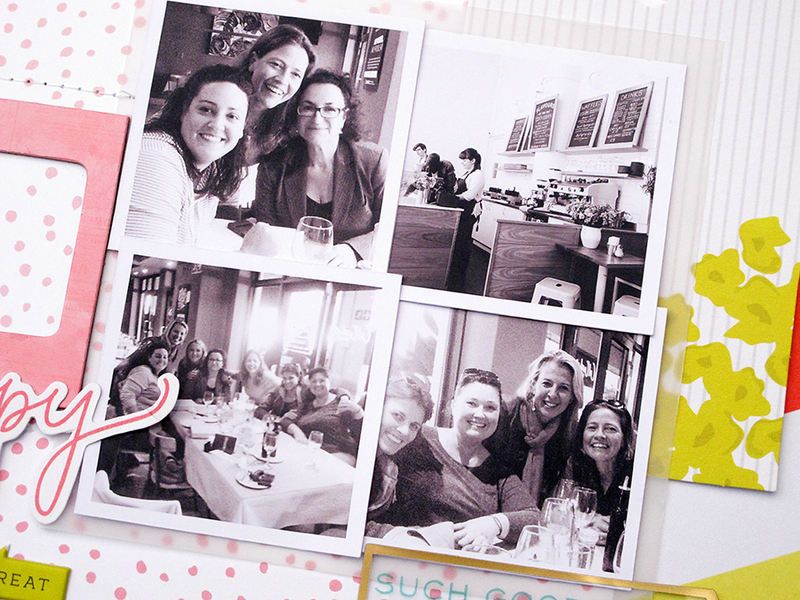 I have some rather grainy photos from my surprise birthday lunch that I really wanted to scrap…so chose this layout that uses x4 smaller sized photos. Making them black & white with high contrast, crisped them up nicely. The wood veneer embellishments from Shop Evalicious are so cute…but I needed a color accent in this top corner. Paint did the trick..a little dauber from the May Hip Color Kit did the trick. I love how it turned out. Then came the extra fun part…the cluster on the left of the photos. I mean really, how does one choose which of the cute embellishments to use, the main kit & the embellishment add-on kit are bursting with options. I settled on items from the amazing Pink Paislee pack & Evalcious stickers which always rock my world. I mean…check out the vibrant colors?! Then came the journaling… easy-peasy when you have a pile of cards from the Hip Kits May Project Life Kit by the ever talented Evalicious & a typewriter. I love the quality & finish of them….they give the page such a classy feel. I hope this page has been inspiring. Have a wonderful weekend!